I get it! You have been on the road, you don’t have a lot of time, how are you supposed to make a fancy dinner for friends? Family? That business colleague you’ve been trying to get the meeting with for forever?! Fancy dinner. Romantic dinner. Get the sponsor dinner. I’m not sure what to title this, use your imagination, this is going to be a rodeo road meal that’ll seal the deal and win the crowd! I am going to break these up into two main “performances”; before hitting the road & at the rodeo. Within each of these rodeo food performances we are going to have a “go-round” for each of our meals. This is made with the belief you will have a small living quarters horse trailer, barbecue or heating unit, or a camper/motor home that you can use. Plan accordingly. 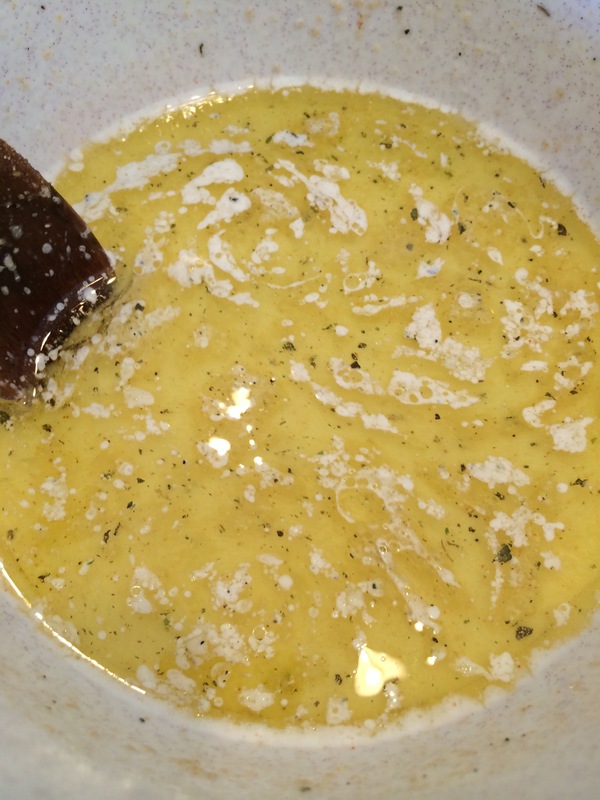 Mix the EVOO, water and milk together. Stick in the microwave for 1:30 minutes; do the baby bottle test on your wrist. You want it WARM not hot. If it is hot, let it cool before heading to the next step. Stir in yeast making sure it is well mixed. Stir in sugar and garlic seasoning. Let it sit for a couple of minutes. 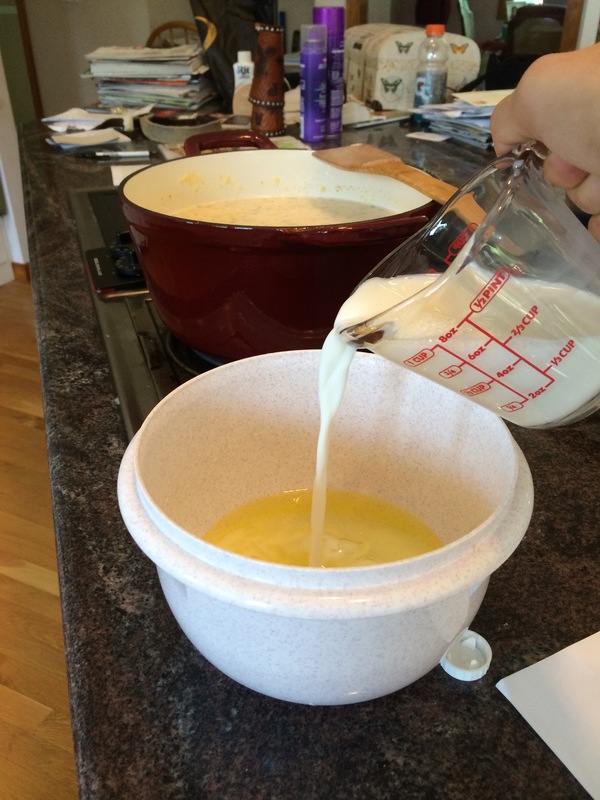 Add flour in first 2 cups, then 1/2 cup at a time until the dough is at an appropriate consistency. Tuck the edges to the bottom, dust and roll in flour. Wrap in plastic wrap and place in refrigerator – ready to go! Get a large pot, preferably a ceramic one, on medium heat with EVOO in the bottom. Once warm, placed first three ingredients into oil. Sauté until translucent. Push vegetables to the side of the pot (or remove if it’s easier for you). Melt the butter in the pot. 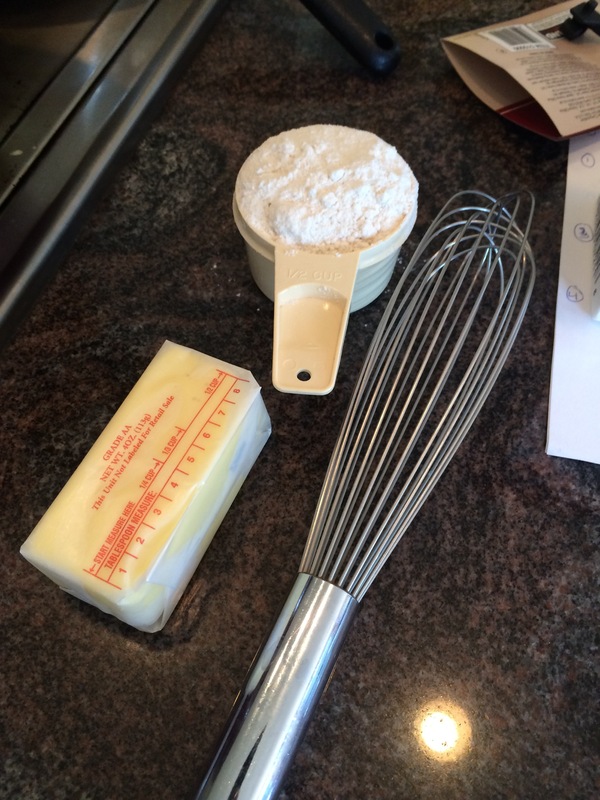 Once thoroughly melted turn the heat to medium-high and whisk flour into the melted butter. Whisk vegetables into flour-butter mixture for about 2:30 minutes until it’s dry. 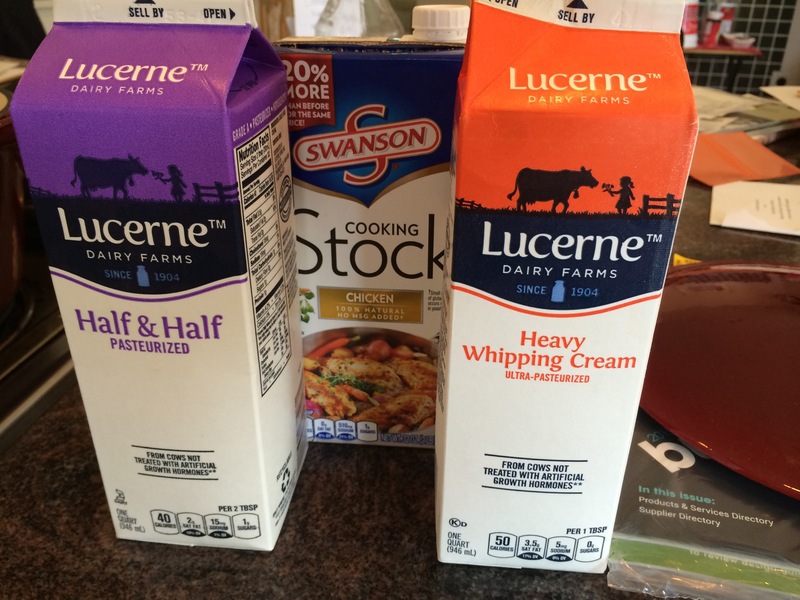 Slowly pour in the heavy cream a little at a time. Continuously whisking. Pour in the chicken stock. Keep at a simmer. 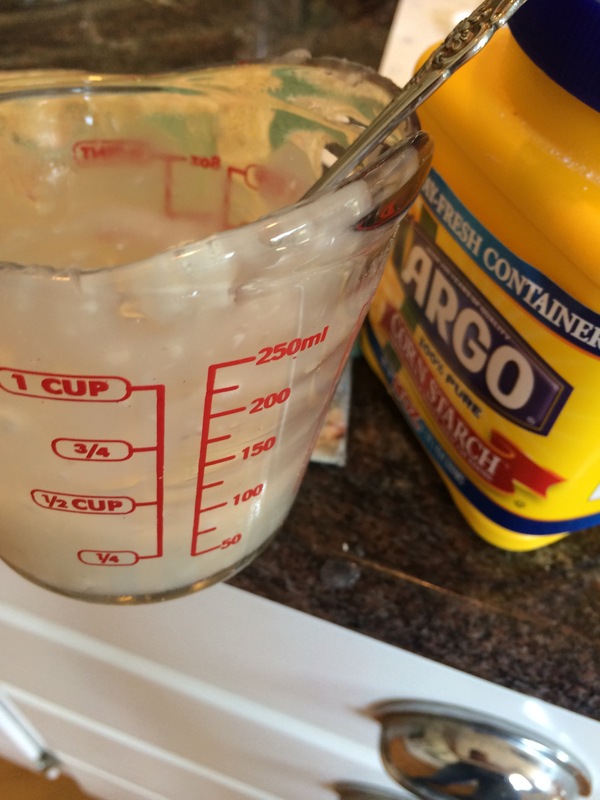 For a thicker soup you can add the dissolved cornstarch. Add 2 Tablespoons of a garlic seasoning and a few good pinches of salt. Stir in the chicken after turning off the heat. Cool in the kitchen sink with iced water around the pot. Once cooled place soup in mason jars or tupperware for traveling. I only took 1/2 of this mixture, leaving the rest at home. 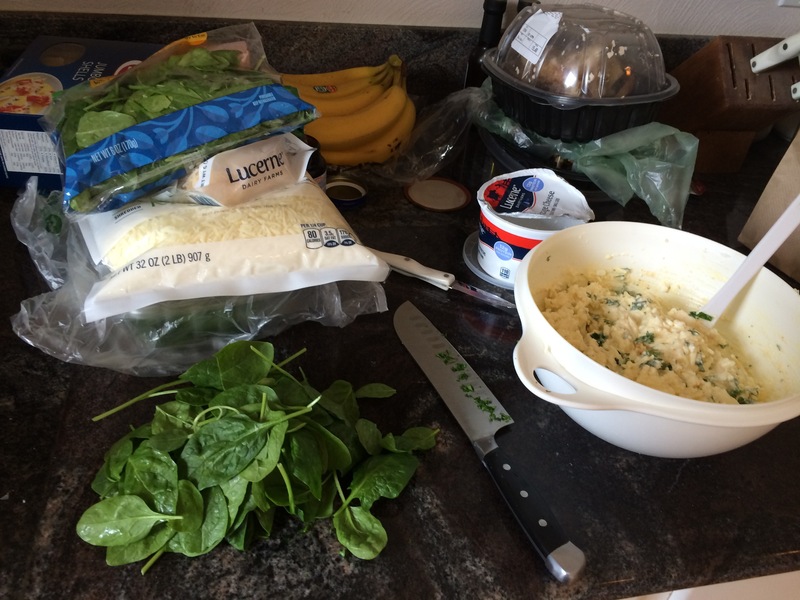 Place all of the cottage cheese, ricotta cheese, parsley, eggs, garlic seasoning, spinach and half of the parmesan and mozzarella cheeses in a large bowl. Mix thoroughly. 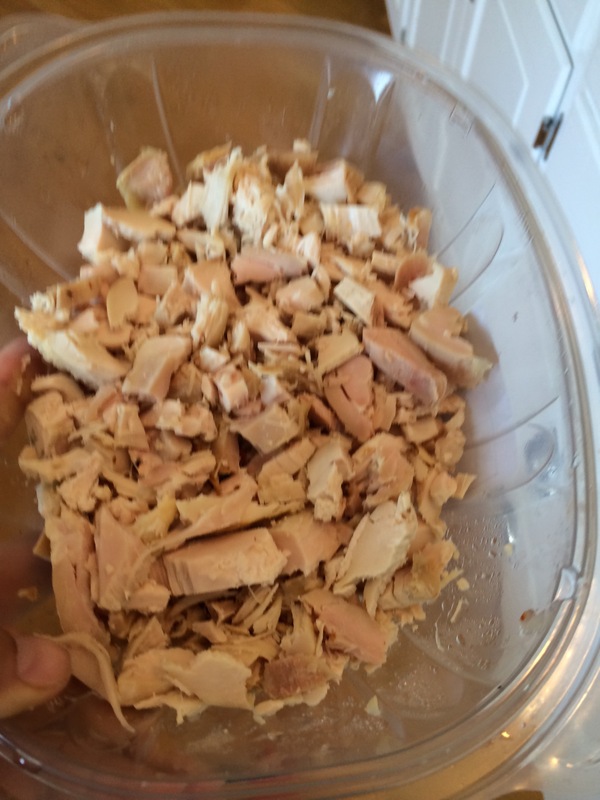 Place entire mixture into a large ziplock bag for travel if you want to fill the shells at location; I like ziplock bags because I can write myself notes on it. The other option is the freezer way; works just as well. Boil the shells according to directions. Cut the corner of the ziploc bag and proceed to fill each of the shells. You can also do this via a spoon from the bowl; whichever is easiest and less messy for you. Place onto a non greased baking sheet and place in the freezer. Now you can store them in a ziploc bag in your freezer, ready to go! choice of fruit flavored rum; mango, coconut, etc. Recommend mango! In a sauce pan, combine water, sugar and concentrates. Cook & stir over medium heat until sugar is dissolved. 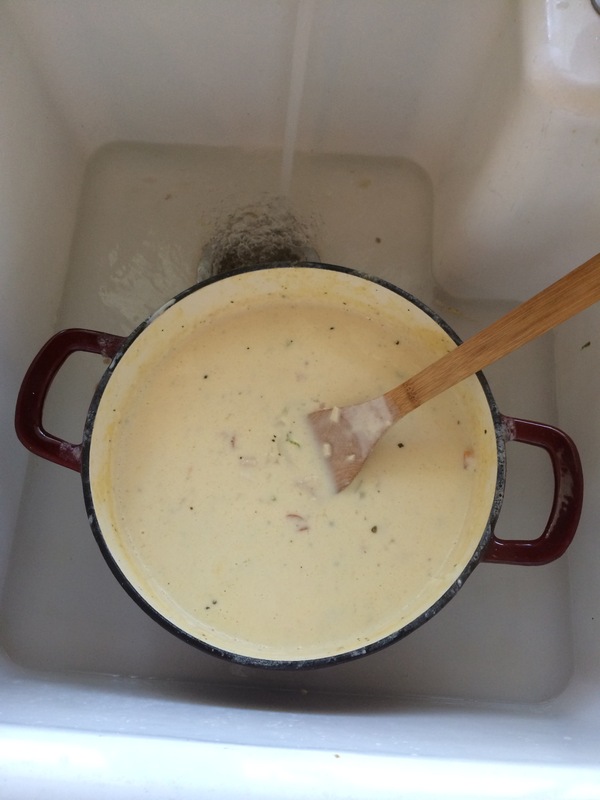 Pour into a shallow 3 quart freezer container. Cover & freeze for 8 hours or overnight. 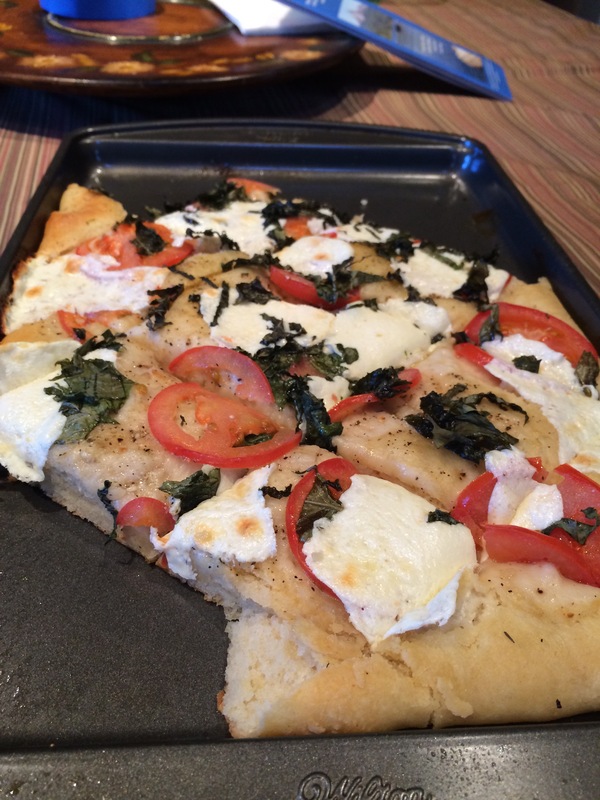 Roll the dough out onto a baking sheet, pizza stone, whatever you have. Heck you can roll it out onto a spread of foil to place on top of the bbq! Stabs holes into the dough, number depends on how bad your run was that day. Place in oven while it is preheating. Pull it out after about 5 minutes. Drizzle EVOO over the dough. Spread sliced tomatoes and the good fresh mozzarella on the dough. Drizzle a touch more EVOO on top with a pinch of salt and fresh cracked pizza. Bake for approximately 15 minutes. Gauge it yourself though because travel trailer/RV/bbq’s are all different. Sprinkle freshly chopped basil on top of the hot flat bread and then slice into triangular pieces to share! Enjoy! Look at you, killing it! You are keeping them happy with some food in their tummy as you finish the rest of the meal! 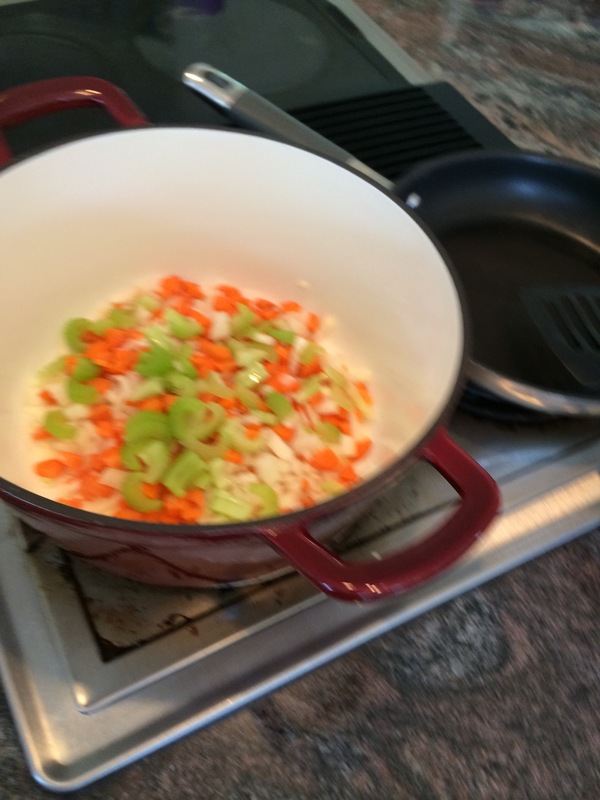 Place the soup base onto the stovetop in a pot; bring to a light simmer. Add gnocchi; cook for about 10-12 minutes. Fold in rough chopped spinach. Once the spinach has wilted you are ready for serving. Garnish with a sprinkle of paprika, leftover parsley, and a dash of parmesan cheese. Done. Bam! 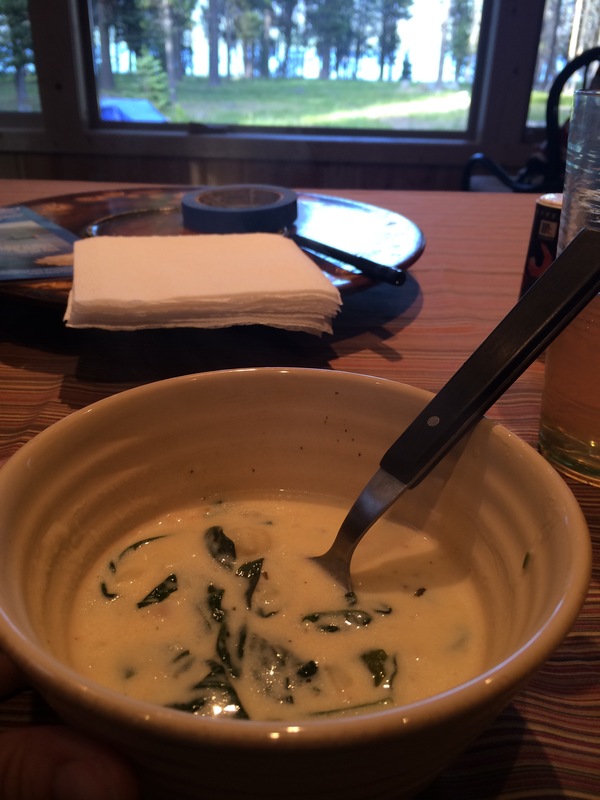 This is very similar to a soup I ADORE at Olive Garden. Preheat the oven to 375 degrees, aka turn it down after the flatbread is done. Cook the large shell pasta according to the pasta directions. Run in cold water to make them manageable once they are al dente. Spread some of the marinara sauce into the bottom of a casserole dish. 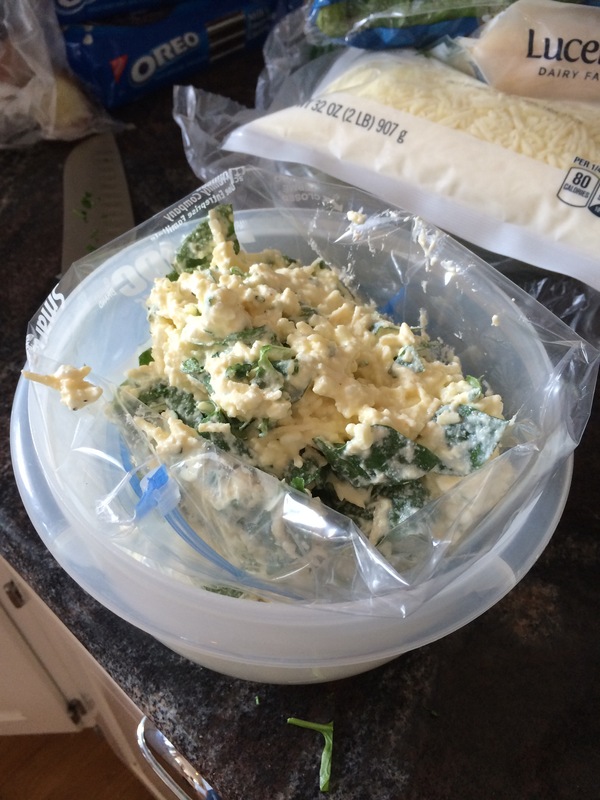 Cut the corner of the ziplock bag off, use that end to pipe the cheese and spinach filling into the shells. Place stuffed shells into the casserole dish. OR, if you have already filled your shells place them in the dish as the oven preheats to thaw them out. Saute the Italian sausage if you decided you wanted; you can do this before you leave if you want. Pour the sausage over the shells and then top the shells with the rest of the marinara sauce in the casserole dish. Top with the rest of the parmesan and mozzarella cheese. Cover with tented foil and bake for 25 minutes. Top with the parsley and serve! Set out for about 30-60 minutes before serving (depending on how hot it is outside). Scoop into cups, I prefer disposable ones at rodeos. Top with your choice of a mango, pineapple, coconut, etc. rum. On a side note, I don’t drink alcohol so I adore these slush cups just as they are! Talk about easy right? Let me know how your next Rodeo Road Meal to Impress goes!